Patriot Platinum International Insurance provides high limit travel medical coverage to individuals and families traveling internationally. 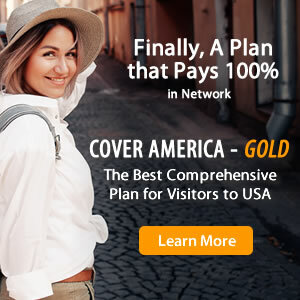 In Network, this temporary visitors insurance plan pays 100% after the deductible is satisfied and out of network pays 90% of first $5,000 then 100% after that. Travel medical protection offered by Patriot Platinum International includes outpatient treatment, emergency services, emergency medical evacuation, and more. Patriot Platinum International Insurance covers trips between 5 and 365 days and can be renewed up to a total of 2 years. Patriot Platinum International Insurance is best suited for US citizens and their families traveling internationally. How to Buy Patriot Platinum International Insurance?